Prologis, Inc., the global leader in logistics real estate, today announced that its 33,700 square metre build-to-suit facility for Czech sports retailer Sportisimo at Prologis Park Prague-Rudna is the first logistics facility in the Czech Republic and only the second such building in Central and Eastern Europe to receive BREEAM’s highest accreditation rating. BREEAM, the world’s leading sustainability assessment method for infrastructure and building projects, awards an Outstanding rating for a score of greater than 85 percent on a development’s performance in several core categories such as governance, land use and ecology, resources and energy, social and economic well-being, transport and movement, and innovation. Completed earlier this year, Building 18 received a final BREEAM score of 88.1 percent, reflecting a design that not only includes the use of environmentally friendly materials but which also provides significant operational savings. Daily drinking water consumption has been cut by 56 percent, while primary energy consumption has been reduced by 20 percent beyond strictest regulations. All energy output is continuously controlled by the most modern measuring systems, while water supply is equipped with leak detection systems. The distribution centre for Sportisimo comprises two rectangular halls attached to an existing building from each side. A sustainable approach was applied during the construction period, imposing strict requirements to avoid any pollution or health and safety threats, choosing building materials based on life-cycle cost analysis and minimizing the amount of waste generated by reusing and recycling a large share of it. The interior was designed with a special focus on providing comfort for all the users of the facility, with thermal control, natural light and fresh air delivered by ventilation utilizing natural air, and noise mitigation. The environmentally friendly aspects of the development are also reflected in its surroundings: large outdoor areas for biodiverse greenery and habitats. Located off the D5 highway, 20 minutes from Prague’s city centre, Prologis Park Prague-Rudna comprises 18 buildings totalling 213,000 square metres of state-of-the-art distribution space. 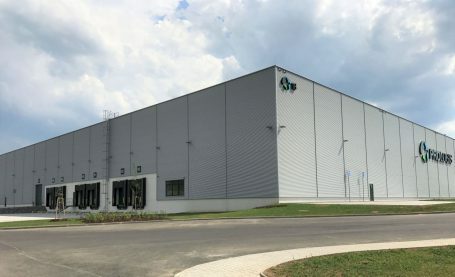 Prologis is a leading provider of distribution facilities in the Czech Republic with more than one million square metres of logistics and industrial space (as of 31 March, 2017).